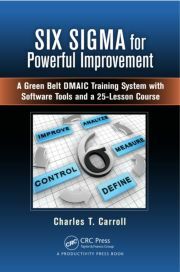 Six Sigma for Powerful Improvement: A Green Belt DMAIC Training System with Software Tools and a 25-Lesson Course explains Six Sigma processes in clear language that's familiar to professional staff of most businesses. BOCA RATON, Fla. - May 20, 2013 - PRLog -- Although the Six Sigma Define-Measure-Analyze-Improve-Control (DMAIC) methodology is a widely accepted tool for achieving efficient management of all aspects of operations, there are still many unwarranted concerns about its perceived complexity and implementation costs. Dispelling these myths, Six Sigma for Powerful Improvement: A Green Belt DMAIC Training System with Software Tools and a 25-Lesson Course clarifies the long-accepted statistical and logical processes of Six Sigma and provides you with tools you can use again and again in your own "real world" projects—removing any doubts regarding their simplicity and "doability.". Trained as and employed as a Black Belt and later as a Master Black Belt, the author presents doctrines and procedures with a strong pedigree and history of success. The book uses hundreds of figures and tables to illustrate key concepts and also makes them available in full-color on the accompanying CD. This is also true of the figures in the user guides that document the accompanying tools. For each of the tools, the book includes a completed sample workbook. The PowerPoint and Excel lessons and tools are provided in both 2007 and 97-2003 versions. Charles Carroll is an independent consultant. Initially educated at the U.S. Naval Academy, he later earned an MS in Systems Management at the University of Southern California and served as a Supply, Logistics and Systems Officer in the Marine Corps. He then worked at Sprint Corporation and General Electric’s Employers Reinsurance Corporation (ERC), where he was trained and certified as an internal consultant in GE’s Six Sigma Quality processes,served as a Master Black Belt for the IT Department, administered the local and offshore outsourcing programs, automated project management, and established a global Project Management Office within ERC’s IT department. Charlie serves as an independent consultant in project/program/PMO management, process improvement, and application development. He has written articles for a number of professional publications, spoken at domestic and international conferences, and developed a number of project management and Six Sigma tools and training for clients. He can be reached at ctcarroll14@sbcglobal.net.